Henry de Bromhead saddled his second Cheltenham Festival winner as Sizing Australia got the better of Garde Champetre in the Glenfarclas Handicap Chase. Twelve months on from Sizing Europe’s Arkle success, de Bromhead was back in the winner’s enclosure as Sizing Australia landed the cross-country event. Andrew Lynch’s mount soon shrugged off the attentions of the gambled-on Maljimar (finished fourth) but had to find plenty in the end to hold the challenge of course specialist Garde Champetre, winner of this race in both 2008 and 2009, by a length and a quarter. The winning trainer said: “That was amazing and I have lost my voice from shouting him home. “It was quite a tight finish so I give him a bit of a roar and he was brilliant. “Andrew gave him a fantastic ride, made plenty of use of him and he has battled on well. “He was ran in this race the last couple of years. He was hampered last year and finished down the field but we didn’t make enough use of him and it was my fault. I told Andrew to ride him how he wanted to today and that is what he did. It just shows that you should leave it up to the jockeys! 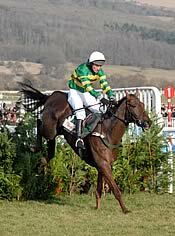 “Sizing Australia has been placed on every other run in cross-country races. Andrew Lynch added: “We were unlucky last year when we were knocked down turning in but he’s very gutsy. He has been placed every time apart from last year and he only a young horse compare to Bolger’s runners. He loves it round there and jumps for fun. “You need to jump very well around the course and they have to adapt to the different jumps. It probably doesn’t suit every type of horse but it suits our lad really well. “It was a messy race last year but Henry said that he jumps so well that I should just keep out of trouble. I heard the commentator say that the favourite was coming and I was just delighted that my lad picked up so well from the back of the last. The Glenfarclas Handicap Chase was introduced to the expanded four-day Festival in 2005. It is one of three races scheduled over the cross-country course at Cheltenham during the season and follows on from the Glenfarclas Cross Country Chase at The Open in November and the Glenfarclas Cross Country Handicap Chase at The International in December. In the 2004/05 season, all three races were won by Spot Thedifference. Cheltenham’s cross-country course was established in 1995. Trainer Enda Bolger and owner J P McManus have teamed up to win four of the six runnings to date with Irish raiders dominating the race and accounting for all six winners.